Political culture refers to the basic values, ideas, beliefs and political orientations by which countries, societies, and whole regions are guided. The underlying belief systems that shape cultures and societies and cause them to behave in certain, often distinct ways. 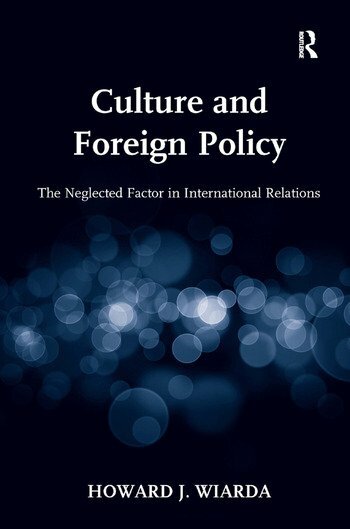 The puzzle or query that chiefly concerns this author is why the United States (US) and its foreign policy have such a hard time understanding cultures and societies other than their own. This provocative book argues that the US needs to end its attitudes of superiority and condescension toward other nations and cultures and redirect its foreign policy accordingly. After an introduction that sets forth the main theoretical and conceptual arguments, the next chapters explore all the main areas of the world. The Conclusion pulls all these themes together, analyzes the common patterns that emerge, and suggests new directions for U.S foreign policy. Howard J. Wiarda is Dean Rusk Professor of International Relations at the University of Georgia, Senior Associate at the Center for Strategic and International Studies (CSIS), and Public Policy Scholar at the Woodrow Wilson International Center for Scholars, USA.